I know it seems ridiculous to have a recipe for bacon and eggs. However, I realized that I make my eggs, in particular, in an unusual way and thought I would share. I scramble them without completely mixing the yolk and the white, which gives them a marbled look and a unique taste. 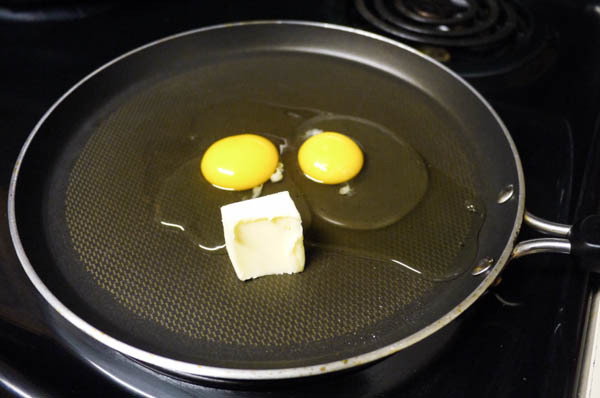 I started making my eggs like this a couple of years ago. My husband and I were taking a road trip and I was researching low-carb restaurant options along our route. Someone warned that a lot of diners actually put pancake batter in their eggs to improve the taste and texture. Naturally, the batter is jam-packed with carbs! And they usually aren’t up-front about telling you when they do this. We stopped at a diner and I asked the waitress if I could have some scrambled eggs with “real eggs only.” I don’t like making special food requests and I was totally prepared for her to have no idea what I was talking about and just drop it. She didn’t bat an eyelash. When she returned to the table with my scrambled eggs, she said “Just as you requested. Note the lovely yellow and white marbling so you can tell they are real eggs.” Genius! They were sooo good too! You get regular bites, bites of creamy yolk, and bites of light egg whites. Cook your 4 strips of bacon in a skillet on medium heat until crispy. The eggs take no more than 3 minutes to cook, so it’s best to do your bacon completely first and then tackle the eggs while the bacon cools off. 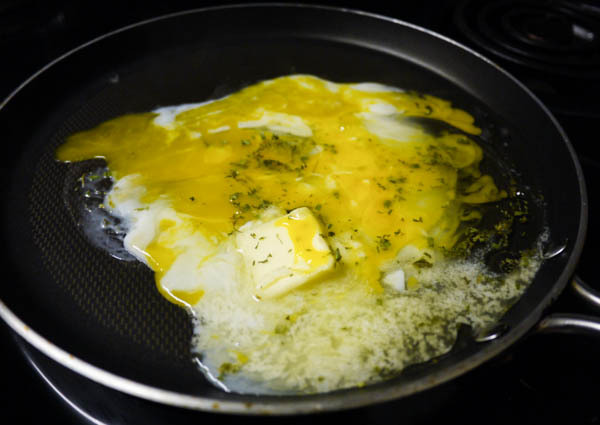 In a non-stick skillet, crack 2 eggs and toss in a tablespoon of butter. Sprinkle over a little Fines Herbes seasoning. Using a fork, lightly pierce the egg yolks so they start to mix with the whites. 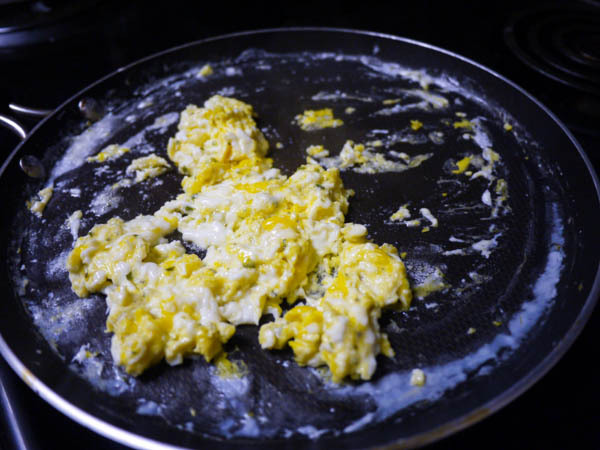 Gently move your fork through the eggs and butter so they begin to scramble. 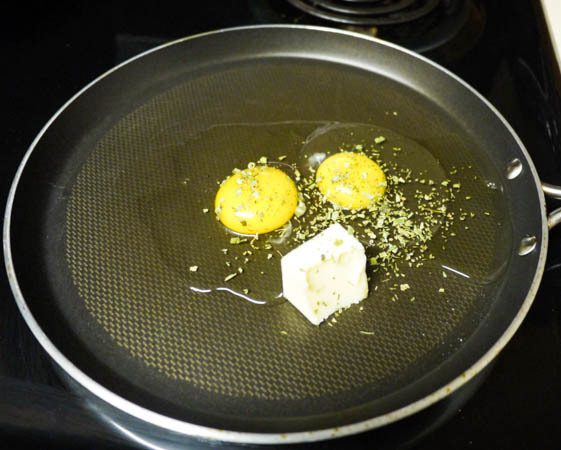 Continue until the eggs are the texture you like and remove from the skillet to a plate. Serve with your bacon and enjoy. 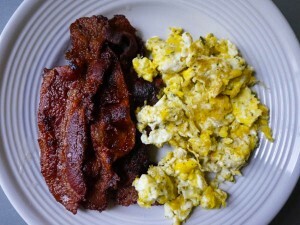 Rustic scrambled eggs with fines herbes and bacon. 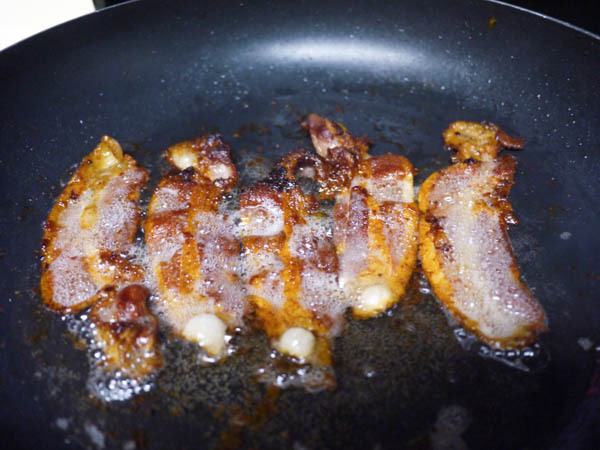 Cook your 4 strips of bacon in a skillet on medium heat until crispy. 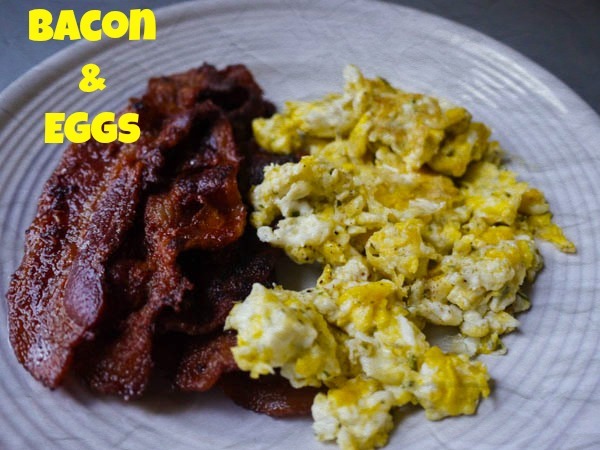 The eggs take no more than 3 minutes to cook, so it's best to do your bacon completely first and then tackle the eggs while the bacon cools off. Your Dad would absolutely love the scrambled eggs and I would enjoy two strips of the bacon. Yum – what a fantastic tip about the eggs – I never knew diners actually put pancake batterin there?! I know EXACTLY what I’m making for breakfast tomorrow morning! The bacon and eggs look absolutely mouth-watering!